Amy Wong’s (王心慰) new effort Reversal of Fate <逆緣> is set to begin production, and TVB has finalized its official cast members. 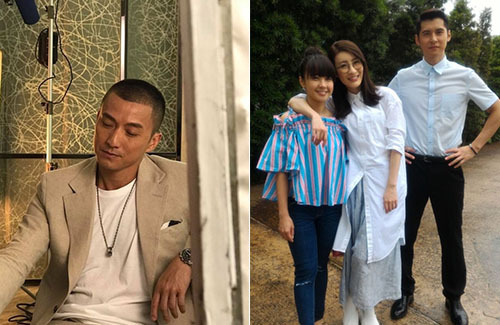 Last week, Hong Kong media outlet Oriental Daily revealed that Wayne Lai (黎耀祥), Rosina Lam (林夏薇) and Patricia Ha (夏文汐) as the stars in Amy Wong’s new drama for TVB. Reversal of Fate will be Pat’s first TVB drama since her film debut in 1982. The 51-year-old has had an on-and-off acting career in the past thirty years. Yesterday, TVB confirmed the remaining cast members with the announcement of EEG’s Carlos Chan (陳家樂), Joel Chan (陳山聰) and Kandy Wong (糖妹). John Chiang (姜大衛) and Lai Lok-yi (黎諾懿) will costar. Reversal of Fate is a fantasy comedy that follows a man from the 1940’s, who after waking up from his comatose state finds himself in present-day Hong Kong. As he struggles to adapt to modern society, the man also starts to experience how the values of humanity have changed over the years. Carlos Chan and Rosina Lam will portray a couple. Joel Chan and Kandy Wong will also have a love line. The 40-year-old actor said he didn’t know Kandy was only 29 years old until reporters pointed out their age difference. Asking if Kandy would be too “young and cute” for him, Joel immediately said, “Am I not young? It’s [a good change]!” He added that he will be sharing many scenes with Rosina as well, and is excited for their new team up. “I’m sure there’s going to be a lot of new sparks,” he said. Carlos will be spending the next three months filming the show. As he wants to concentrate on his role, he won’t be accepting any other job offers in the meantime. He had to turn down a few movie offers to accept his role in Reversal of Fate. Eh, doubt Carlos had to reject any jobs because there are probably no time for him to accept anything. I’m sure this requires him 20 hours a day to film like the rest of other filming schedule lol. @jjwong Yea…I’m actually kind of surprised Carlos would go back to filming TVB series (or that EEG would let him do it) after he was on such a winning streak with the movie “Happiness” last year (great movie by the way, with memorable performances by both Carlos as well as Kara Hui, who again deservedly won multiple Best Actress awards for the role). It’s not like filming a TVB series will help him in any way given he’s already established a pretty good path in movies. Worst decision ever if you ask me…. Inviting Patricia Ha to film for TVB of course makes sense, since she was pretty famous back in the day and basically already retired — though the irony here is that TVB didn’t get “first dibs”, as Patricia already filmed the next installment of the Margaret and David series for ViuTV (hence the article’s “first TVB series” reference — for once, Oriental Daily actually got it right, lol). Rosina finally returns to filming. My favourite actress is back !